As an alternative to pyrethrum based products, Cirrus delivers effective flush, knockdown and kill with results you would expect from a 3-percent pyrethrum-based fogging concentrate. Cirrus concentrate features a synthetic active ingredient, prallethrin, which is designed to achieve results comparable to the botanical extract pyrethrum. 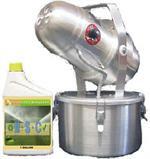 Cirrus fogging is dual-synergized and delivers control of stored product pests, cockroaches, ants, flies, spiders, fleas, and many other crawling and flying pests meaning it is ideal for restaurants, commercial and institutional kitchens that these type of bugs frequently invade! Would you like to see the Cirrus Fogging Concentrate Label? How About The Cirrus Fogging Concentrate MSDS sheet?